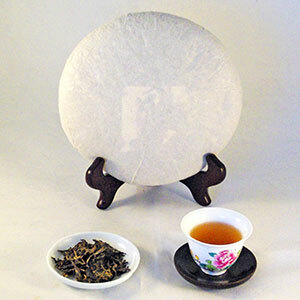 Many small-scale family-owned tea factories in the early 2000s produced tea cakes wrapped in blank white papers so the buyers would rewrap them with their own branded paper. Although this cake was not made from early spring picks nor from old trees, it consists of many tender buds. Steeped to a golden hue, the tea reveals a smooth, warming dried fruit flavor with a sweet aftertaste. A good-value tea for large group entertaining and for everyday consumption. Use 4 grams per 6 oz of water.